Craftio Ergo Sum: A cool new yarn-- if only I had more time to crochet! A cool new yarn-- if only I had more time to crochet! So, I've discovered a lovely new yarn-- Red Heart Collage. It's a 2 ply self striping acrylic yarn and each of the plies is a different color so the stripes have this heathered look to them. Now I know some people poo poo Red Heart, but this one feels nice and soft and for charity items it really is best to have something washable. 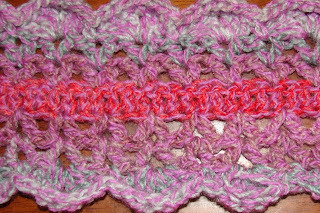 Check it out-- the scarf is not quite done yet, but this is all done from a single skein of Collage in Rose Dust. Pretty cool, huh. I have not been able to do too much lately except work on the scarf above for Compassionate Creations. (and start a hat for the Hat Sawp on Crochetville, but, shhhh, it's a secret) On the plus side, I've been able to go running and my house is much more clean than it's been in eons! I guess it's a tradeoff. Wow that looks great! Love it! I have an Etsy store now! This shawl is actually for me! Yet another non-blue "Blue Curacao Shawl"